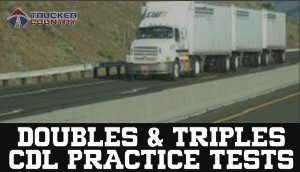 Free Online Doubles and Triples Practice Test questions and answers to help you pass your state’s DMV Doubles & Triples exam. Now 3 testing modes to help you prepare. To pass the CDL Doubles and Triples written exam, you’ll need to demonstrate understanding about how important safety is when driving with more than one trailer. Drivers must also know how to couple and uncouple correctly, and about inspecting doubles and triples. When pulling 2 or 3 trailers, there are more things that can go wrong, as they are less stable than other commercial vehicles.